Pay tribute to your favorite pedigree with these cozy socks. There's something intensely special that drew you to your pup's breed, be their shiny coat, adorable smushed nose, or the way they snuggled up to you instantly. So when it comes to repping your furry family member, there's no act large or small you wouldn't do to showcase your devotion. These cozy socks are a humble tribute to your favorite pedigree. Featuring a detailed graphic and name of the breed, you'll let it be known just how much you adore your pooch. Made in Vermont. Gave these socks to my daughter who loves her pet. These socks are a great gift idea. He absolutely loves the socks. They fit well and are super fun. I originally planned to give these to a male relative - they are sized for a woman - missed that somewhere in the description. Very cute idea for your dog lover friend or family. Great gift idea for the hard to buy for. 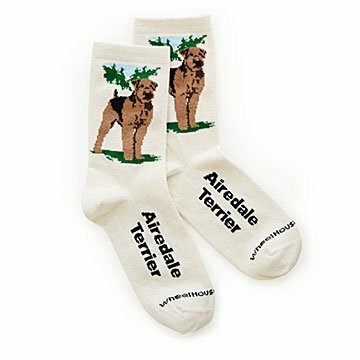 Adorable socks for the dog lover you know! This is a great gift for a dog lover.